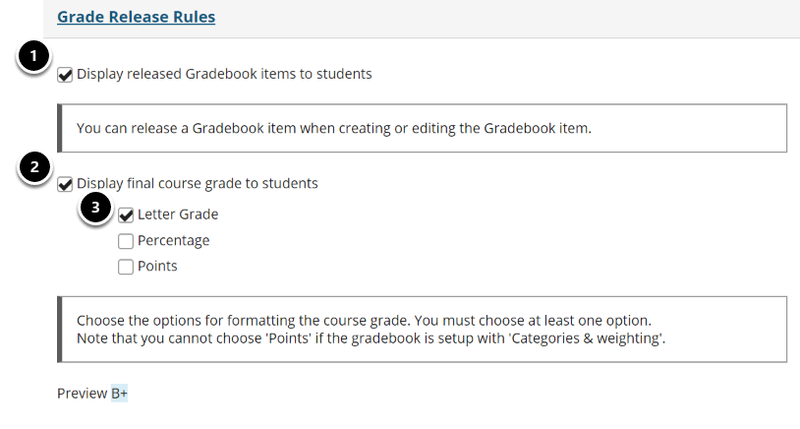 Sakai Community DocumentationSakai 19 User Guide (English) GradebookHow do I set up my Gradebook? The Gradebook is the hub for all graded activities and points earned in your site. There are several settings you can set up for your site, such as Grade Entry in points/percentages, Grade Release Rules, Categories and Weighting, and Grading Schema. 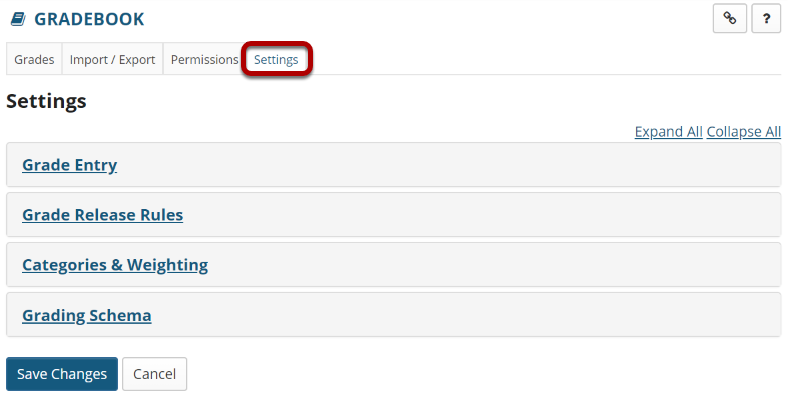 Select the Gradebook tool from the Tool Menu in your site. You can select either a Points based gradebook or a Percentages based gradebook, depending on your preferred method for entering grades. Check the Display final course grade to students box to show students their final grade in the course as calculated in the gradebook. If you have selected to release the final grade, choose your preferred format for the grade display: Letter Grade, Percentage, or Points. You can choose to have No categories, Categories only, or Categories & Weighting in your gradebook. The No categories option is used when you want to have a simple grade calculation based strictly on the points or percentages of all your gradebook items, without any groupings, weighting, or dropping of items. The Categories only option is used for grouping similar gradebook items, like all homework, or all projects. This option also allows you to drop grades within categories. 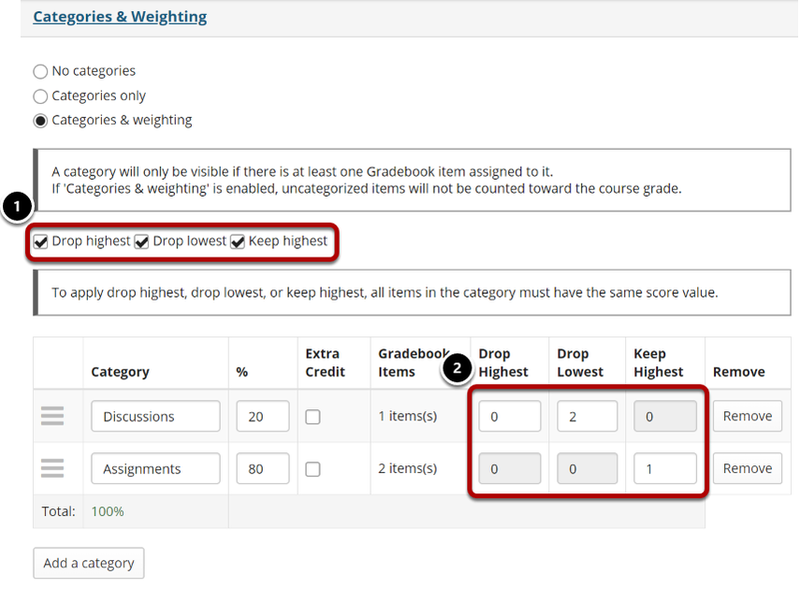 If all items within a category have the same point value, you can choose to drop the highest grade, keep the highest grade, or drop the lowest grade within the category. 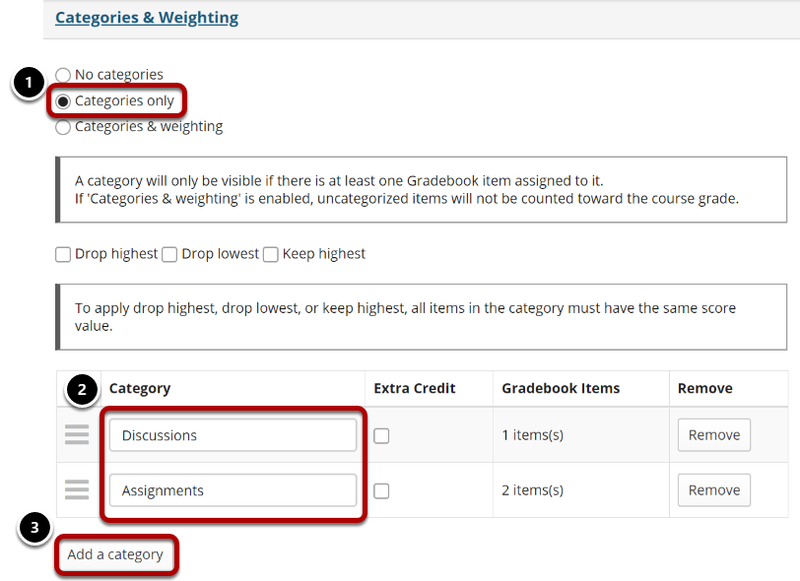 The Categories and Weighting option groups items and supports weighting of grades. 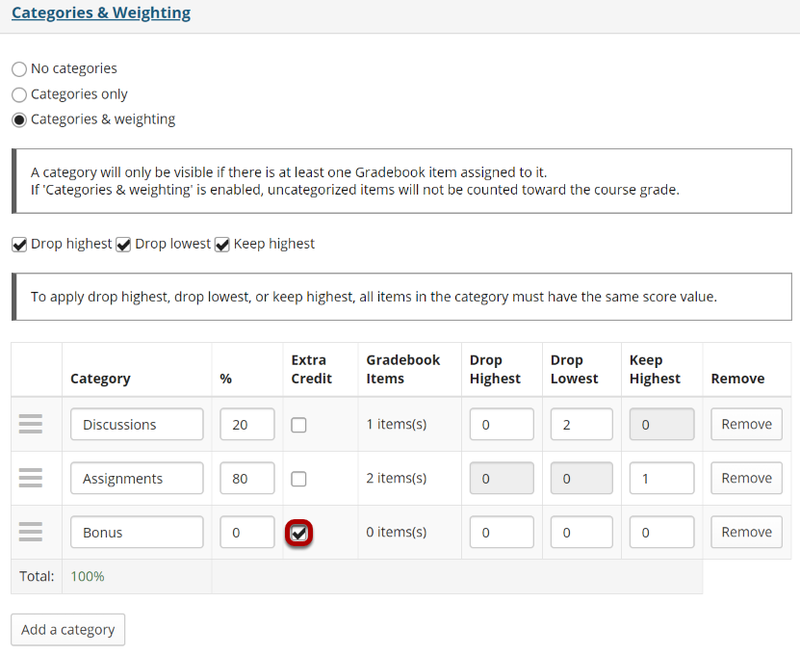 For example, if all homework assignments added together comprise 20% of the final course grade, projects make up 50% of the course grade, and exams are worth 30% of the final grade, this option will allow you to group the items and weight them accordingly. Note: If you use Categories, you must have at least one Gradebook Item in each category to enter grades. For example, if you have a Final Exam worth 30% of the final grade, you will need a Final Exam category AND a single Final Exam gradebook item within that category. 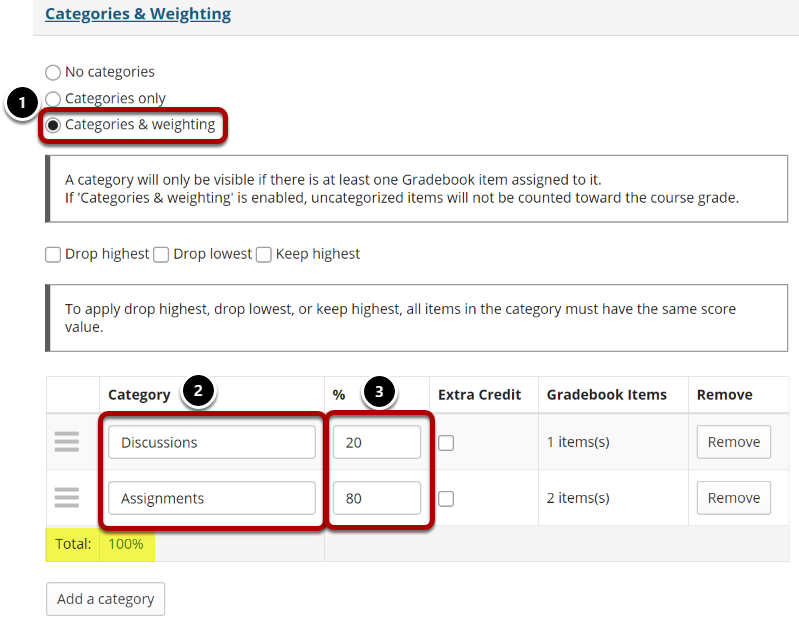 Tip: If you would like to be able to drop grades, you should select either Categories only or Categories & Weighting. Select the radio button for Categories only. If you need additional categories, click on the Add a Category link to enter additional category titles. Select the radio button for Categories & Weighting. View the different categories that you plan to weight in your grading scheme. Enter the percentage weighting for each category. Note: The percentage for all categories taken together must equal 100%. Enabling drop lowest and/or keep highest. If you selected either Categories only or Categories & Weighting, the enable drop/keep options will appear. All items within a category must have the same score value in order to use the drop/keep options for that category. Select the check box next to each of the desired drop/keep options. Drop Highest: Automatically drops the highest score/s among items in a category. Drop Lowest: Automatically drops the lowest score/s among items in a category. Keep Highest: Automatically keeps the highest score/s among items in a category. In the appropriate column, enter the number of items in each category that you wish to drop or keep. Tip: Many faculty prefer to use Keep Highest as opposed to Drop Lowest, since it reflects a more accurate running total of student grades during the course of the term. Items that students have not yet completed are not dropped automatically, so one or more higher scores may be dropped until all items have been completed. If you would like to designate a category as extra credit, select the check box in the Extra Credit column next to the category. Extra credit items add to the student's total grade, but points do not detract from the overall grade if not completed. For more information on extra credit, see How does extra credit work? Tip: Both entire categories and individual gradebook items may be designated as extra credit. However, you cannot have an extra credit item within an extra credit category. You may drag and drop to reorder categories. Click on the reorder icon to the left of the category and drag it to the new location. If you would like to delete a category, click the Remove button for that category. Choose your preferred Grade Type: Letter Grades, Letter Grades with +/-, Grade Points, or Pass / Not Pass. Once you have finished with your gradebook setup, don't forget to click on the Save Changes button at the bottom to save your changes. Next: How are grades calculated in Gradebook?